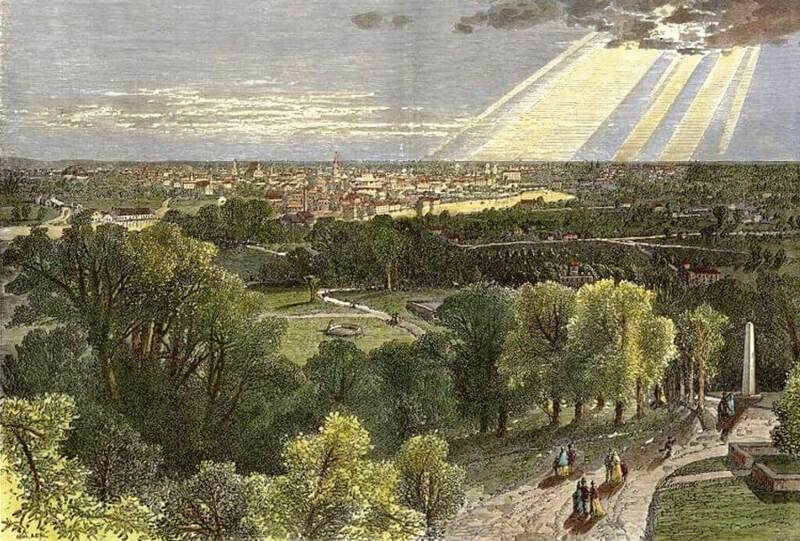 The morning of April 16, 1871 dawned sunny and cool in Rochester, with a light veil of fog over Charlotte. 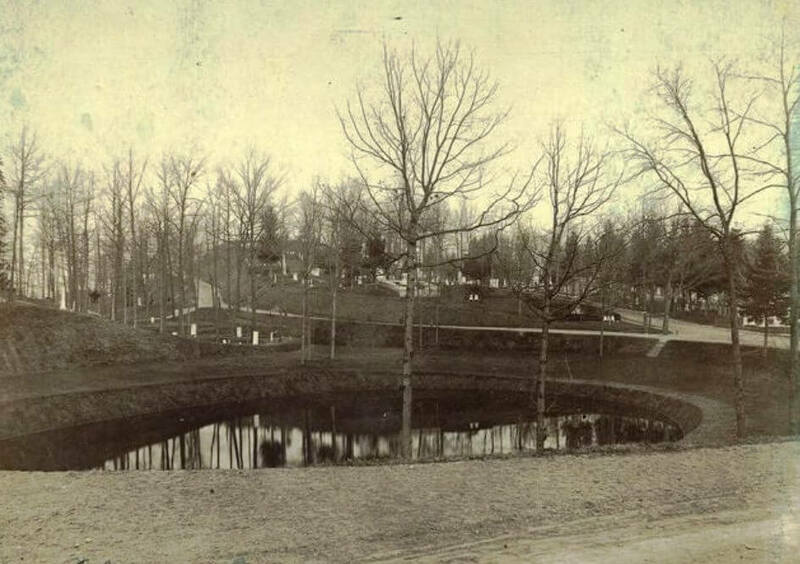 Although a bit early in the spring for a Sunday junket, rising temperatures during the day persuaded many city residents to take a carriage ride or the streetcar to Mount Hope cemetery to spend a few hours communing with nature among the hills, ravines, budding trees, and head stones of one of America’s first “rural cemeteries,” places designed to centralize urban burials in a park-like setting outside of the city proper. Leaving this spot where costly marble piles reign in profusion, we proceed to the tower. There are crowds of visitors upon its top, but nothing daunted, we begin to climb the winding stairs. There was a constant stream both up and down, so that our progress was not very rapid. But we reach the top at last. And securing as comfortable a position as possible in the crowd, we leaned against the railing and looked below and upon the surrounding scenery and landscapes… Gradually, the crowd dispersed from the tower, and there seemed a few quiet moments to spend in the luxury of looking upon nature’s varied beauties and Yankee improvements without the disturbing influence of a fluctuating crowd. Some eight or nine miles to the north of us appeared, at intervals, a leaden-hued belt edging the amber horizon. I judged it to be Ontario. A gentleman standing near remarked that the lake appeared very rough today. “Yes, I see the white caps” was my uncle’s response. I turned and looked at them both and could not restrain a laugh, “See the white caps, uncle; why I can scarcely see the lake”….Another gentleman, not belonging to our party, hearing what we said, stepped forward and offered me a small hand telescope…Adjusting the telescope properly, I looked in the direction of the lake. There were white caps, sure enough, and a steamer chartered for the day as a pleasure boat had just left Charlotte harbor and soon rolled and pitched about in a manner I thought would conduce but little to the enjoyment of most of the pleasure seekers on board. As if suddenly by a great tidal wave, old Lake Ontario had burst her confines and buried the entire north part of the city; and where generally thousands of buildings and churches are visible, nothing but the blue waves of the lake could be seen…..Away to the right and left, as far as the eye could see, was the Canada coast (where) could be seen her shores, studded with mountains, hills, valleys, inland bays and lakes, rivers and forests; and so perfect at times that the sun’s rays, shining on the barren sand cliffs, would illuminate their sides like dazzling mountains of glass. 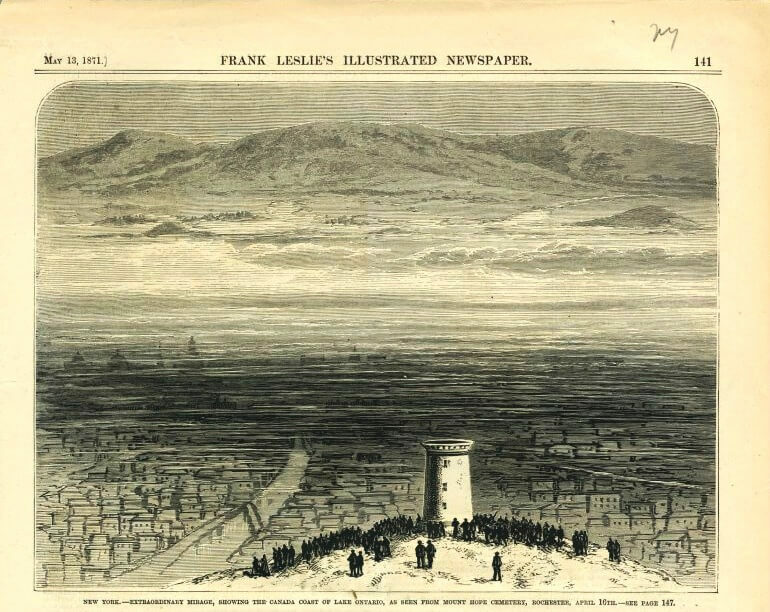 While given only cursory coverage in the next day’s local papers (which seems strange given the large numbers of spectators involved), the “Rochester Mirage” was considered newsworthy enough to warrant a highly-imaginative half page illustration in the May 13, 1871 issue of Frank Leslie’s Illustrated Newspaper, published in New York City. The mirage soon disappeared, but the Fandango endured, at least for a few more years. Constructed of wood, painted and scored to look like stone, it became so dilapidated that it was eventually torn down. No records tell of who built it or exactly when. No records tell how soon after 1871 it was removed, although we know it went to pieces some time prior to 1885. Although there are references to remains of the Fandango still being visible in one of the cemetery’s ravines, in reality all traces have long since vanished. However, a flight of stone steps leading to the hilltop likely date from the time of the tower’s construction. 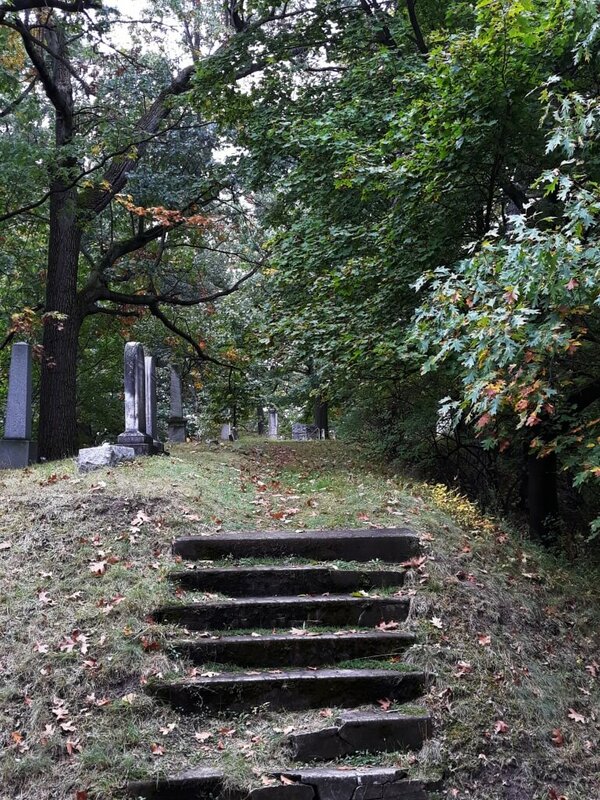 The Fandango’s site on the heights of Mount Hope (Section I of the cemetery) is now simply a flat, grassy, open space bordered by the graves of the Bowens, the Simpsons, the Redfields, and perhaps most appropriately, that of Gideon Cobb, who gave his name to the only taller hill in the city. 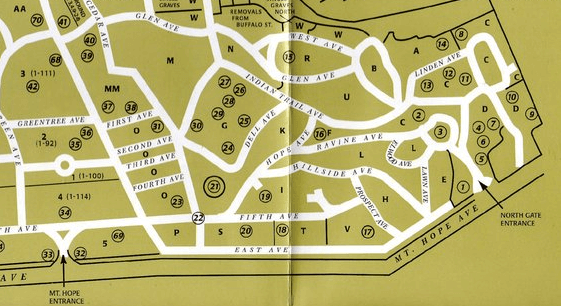 Map of Mt. Hope Cemetery. The Fandango was located in Section I. 1. Not just a Spanish dance, a “fandango” is also a pejorative term meaning “a foolish or useless act or thing.” Clearly not all of Rochester residents were impressed by Mount Hope’s observation tower. 2. The optical phenomena, known as a Fata Morgana is a type of mirage which results from an atmospheric inversion of a layer of warm air over a layer of much cooler air. Such an inversion can cause light rays to be bent as if passing through a huge lens, projecting magnified images many miles away.